Guelph’s urban forest to grow thanks to residents and TD Green Streets grantGuelph, ON, September 16, 2015—Over 200 Guelph households will add a tree to their yard thanks to a $15,000 grant from TD Green Streets. All available trees have been reserved and will be collected during the City’s Adopt-a-Tree event this Saturday. 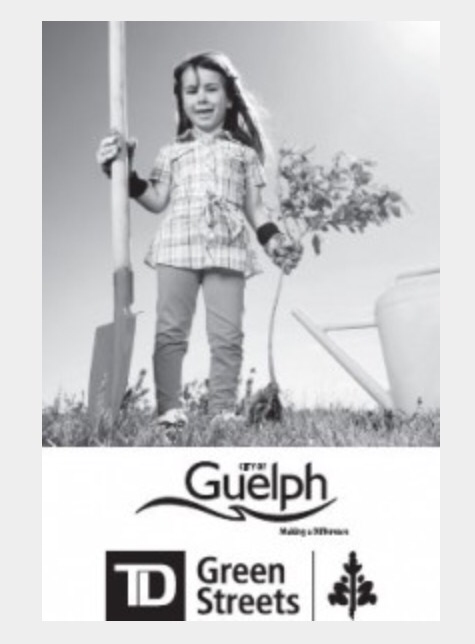 At the event, experts from the City of Guelph’s Healthy Landscapes program, Pollination Guelph, the University of Guelph Arboretum and Trees for Guelph will help residents select the right species for their yard, and provide planting and care advice. Guelph residents were invited to register for a tree on a first-come, first-served basis beginning August 27. The 150 trees originally allotted under the grant were reserved within one week and many more requests followed. The City worked with TD FEF to provide an additional 90 trees, allowing the City to provide trees to all the residents who responded to the initial offer. The TD Green Streets grant also supported a reassessment of Guelph’s tree canopy. Results of this survey are currently being reviewed. Applications to the 2015 TD Green Streets program were open to Canadian municipalities, First Nations communities and Business Improvement Associations (BIAs) in Vancouver, Montreal and Toronto. All submissions were reviewed by regional Tree Canada Community Advisers, Board Members, urban forest practitioners and TD Friends of the Environment Foundation representatives based on innovation, community involvement and technical expertise. For more information about tree care and Guelph’s Urban Forest Management Plan, visit guelph.ca/trees. For more information on the 2015 TD Green Streets winning submissions, visit tdgreenstreets.ca. ← I Need your Help #Guelph! @DowntownGuelph Parking Feedback Needed ASAP!